It's of course inspired by the Fast and Furious films, which I love to pieces. I got the first ideas for this story a while back when I first saw the films. 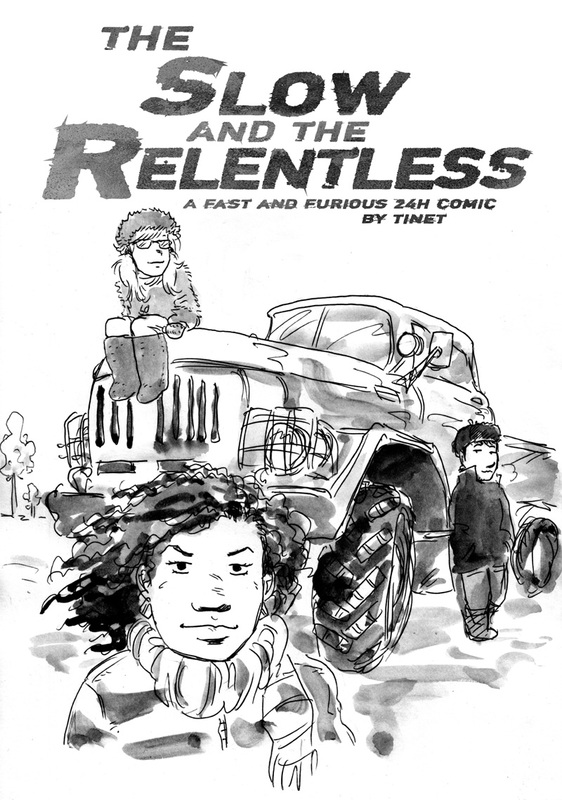 After Paul Walker's untimely death I marathon-watched all the films again, and when I sat down to draw this year's 24h comic, it was clear that this had to be it. Since I like to whine about how Joann Sfar has basically only one female love interest character in his comics (Zlabya/Chava/Chagall's girlfriend/the Greek girl in Vampir), everybody can now also whine about how I myself basically have only one male love interest character in my comics, as Karim clearly provides the missing link between Ting Yay and Aeron! Yay! 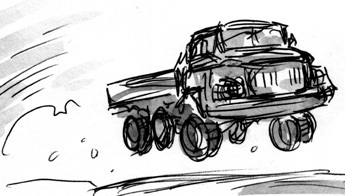 ZiL-130 and ZiL-131 - the best general purpose trucks in world history. ZiL-131 is the military version of the truck, with three axles, superior in off-road conditions, and ZiL-130 the civilian, with two axles (but you can now find both in civilian use). Truck racing in Russia is certainly a real thing, and they do it with ZiL-130 and various GAZ trucks. In the racing world, the trucks are naturally heavily customized, and many put the more heavy-duty ZiL-131 cabin on their ZiL-130. 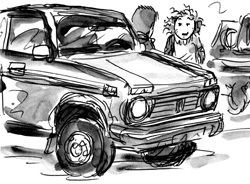 Lara in the comic has a proper ZiL-131, and Tonya drives a ZiL-130 with a ZiL-131 cabin on it. Lada Niva (VAZ-2121) - the best jeep in world history. It's light, strong and uncomplicated. The perfect ride for a young man who doesn't need to compensate for anything. 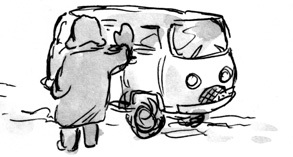 UAZ-452 - the best van in world history. It's an off-road van, popular all across North and Central Asia, and a good driver can go with it where even fancy Japanese jeeps falter, as I have personally experienced during a three-week trip across Mongolia in an UAZ-452 with a driver called Sukhe. The UAZ-452 is shaped like a bread loaf, so one of its nicknames is Буханка, the Russian word for bread loaf.